The social classes did not mix in life - or in death - the ground was divided into first, second, third and fourth class graves for each religious denomination. 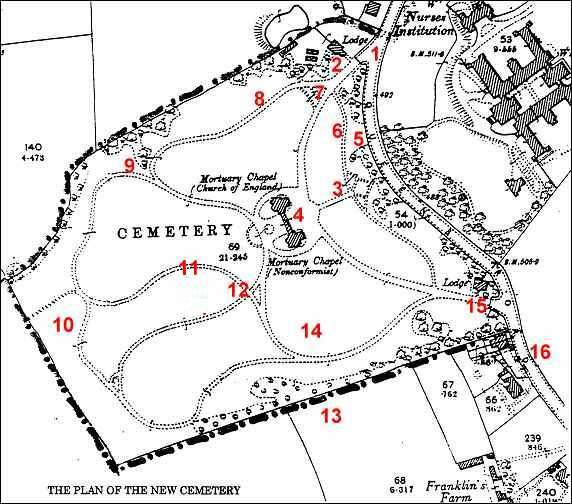 There was a dispute about the number of cemetery chapels to be built. ...... the council accepted a petition from the churchwardens at St Peter’s church that there should be one chapel “for church people” and another for “dissenters” and by 14 votes to 7 agreed to build two chapels without consulting the ratepayers. Click here for instructions on how to navigate this walk. The tour consists of two main areas. 1) A series of photographs taken on the walk, these can be accessed by clicking on the map above or by selecting from the list given above. You can also use the and buttons at the bottom of the photo pages to 'step' through the walk. 2) There are also additional notes and maps which will help your understanding of the history discussed on this walk. They are not included in the 'tour' as they may distract from the 'flow' of your walk, but they are essential if you want to get the most out of your walk - they are accessed by hyperlinks from the photo pages and also from the list given above on this page. Clicking on at the top of each page will take you to the main list of all available tours around Stoke-on-Trent. Clicking on this button at the top of each page will bring you to this index page so you can make another selection from the map or list. On some pages you will find clicking on this will take you to additional information, but is not part of this tour and so you will need to use your browser back button to get back on the tour. If you get lost then email me.